This has no connection whatsoever with my next novel. Just a cool fact. Here is the world’s largest incense holder. 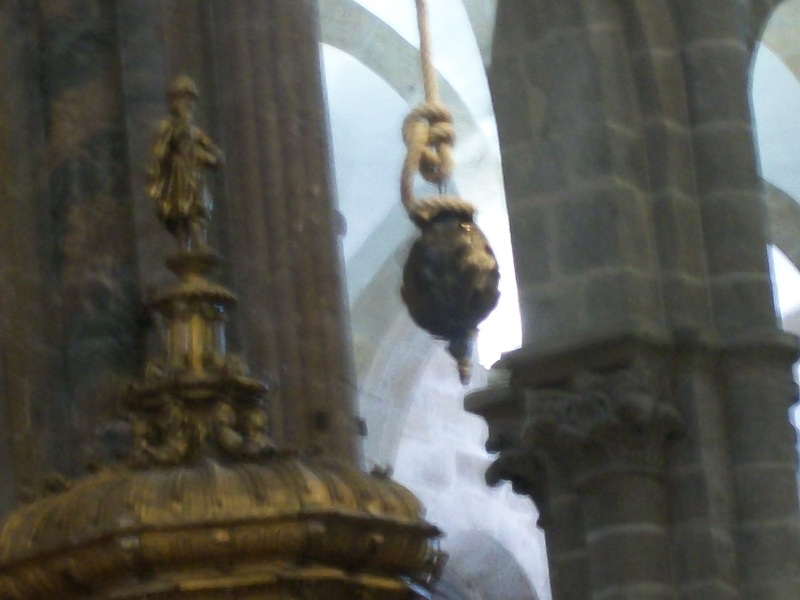 It’s in the Cathedral of Santiago and weighs 119 lbs. 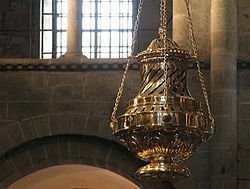 More precisely, it’s a botafumeiro, to be swung into motion by eight lusty men, making an arc of sparks and incense streaking across the transept. We didn’t see this, since we didn’t go on a holy day, but imagine. Imagine particularly a high mass in 1499 when Catherine of Aragon was innocently attending (innocent also of how England’s King Henry VIII would come to do her wrong) and the butafumeiro cord broke, sending the whole contraption crashing through one of the high windows. Don’t you just hate when that happens? Anyway, the moral is, be careful of renegade butafumeiros but if you are in Santiago on a holy day, go to the cathedral and watch plumes of incense arc over your head.